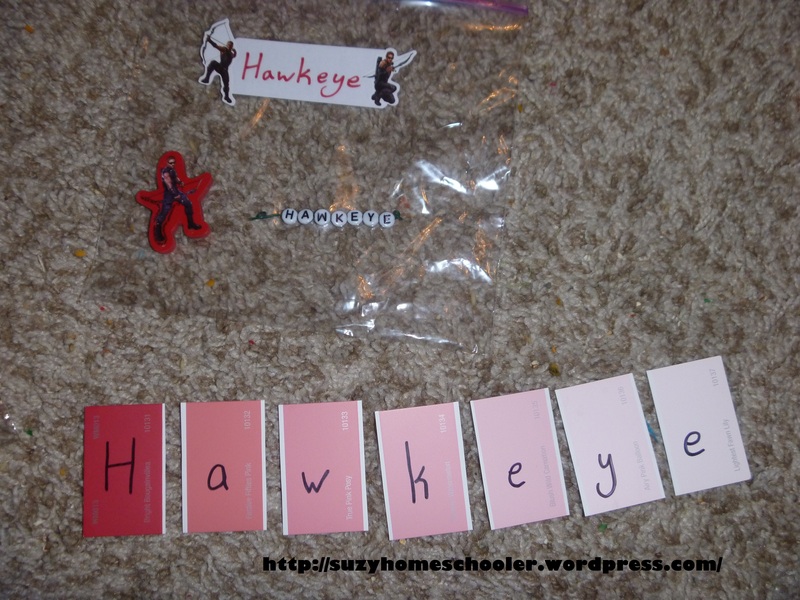 There is an endless supply of ideas on the web to teach children their name. People do it using paint chips, bottle caps, and a whole slew of other items. Why wouldn’t there be? A child’s name is very important to them. 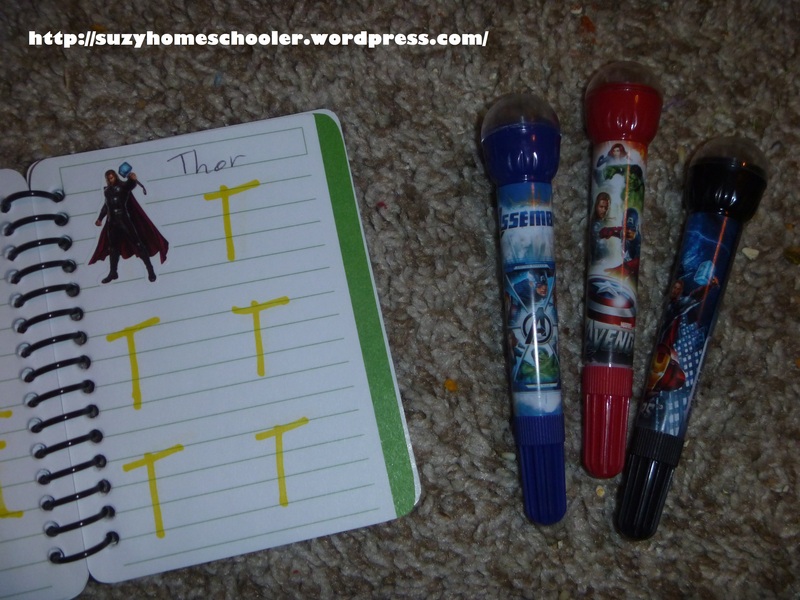 And so the Avengers Literacy Kit was born. 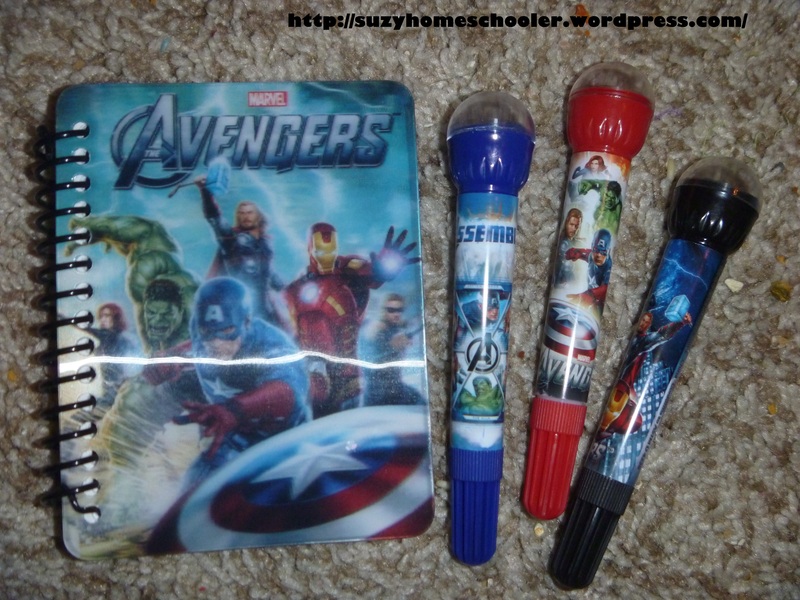 I already had everything else I needed at home: stickers of each character, a note book with the characters on the cover, markers with the characters on them, erasers with the characters on them…basically I’m saying I had alot of crap with pictures of superheros on it. I keep a box in my closet for each of the kids, and whenever I find a good bargain on something they might like, I buy it and toss it in the box. By the time December comes around I’ve already bought 90% of their presents during sales throughout the year, and items from Target’s dollar section make easy stocking stuffers or quick rewards for whenever needed. Much of what I used came from purchases made months ago from Target’s dollar section. 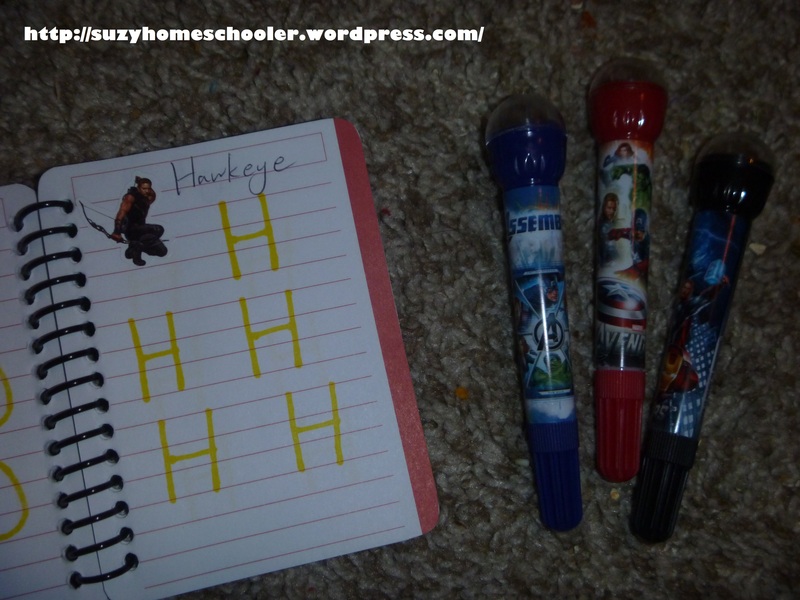 In each baggie (so far) is an eraser with an image of that character (no purpose, just for fun), some beads that can be threaded to spell out the character’s name, and paint chips which can be lined up to spell out the characters name. I’m hoping to later add mini playdough mats with the letters of the character’s name and a small jar of of playdough. 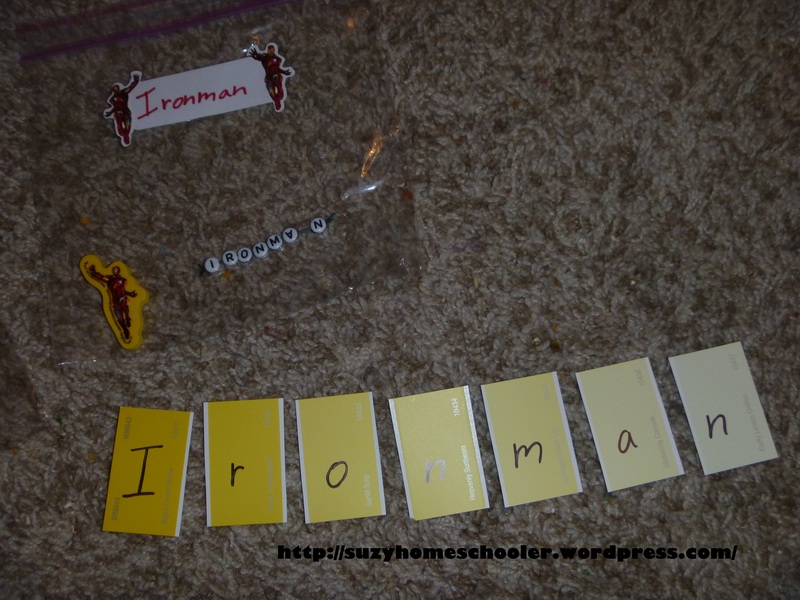 I figure I can write out the letters on 3×5 index cards, add a sticker, then laminate them and toss them in the bag. Should be easy-peasy. I’ll update this post when the bags are finished. Nothing fancy. I just put stickers on pages, wrote out the character’s name next to the sticker, then wrote the first letter of their name several times in yellow highlighter for LittleMan to practice his tracing. So far LittleMan seems to keen on playing with it. He’s not really into tracing the letters in the notebook but he’s enjoying the beads and the paint chips. I look forward to seeing how he’ll react when I get around to making those playdough mats. I seriously love this and think it’s a great way to work on literacy skills. We have done this with animals and it was a success! (I used Safari Ltd. toob animals, index cards cut with the animal names and laminated and also picture cards to match them to the figure and name.) 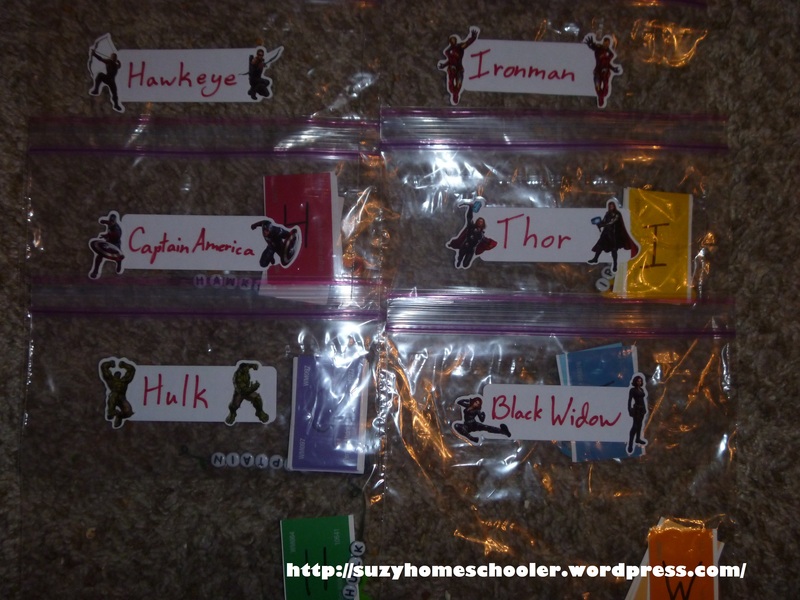 However because we have been on a Marvel kick recently, the kids have really enjoyed learning about each of the different Avengers. The paint chips are fantastic for spelling their names and I like that they are colour coded as well. 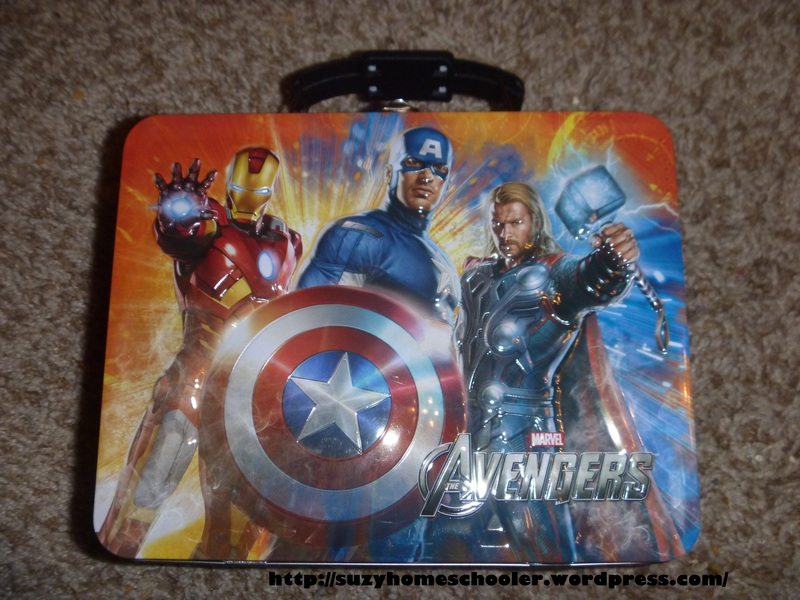 I missed out on the Avengers supplies at Target, so hopefully they will have more what with the new Marvel movies.